Dallas Net There for the Taking. The Dallas Stars net is there for the taking. All the team needs is for someone to actually step up and take it. The beginning of Dallas’ season was rough. Really rough. Seven wins in the first 20 games rough. The middle wasn’t much better, but at least there were glimmers of hope with a few three game winning streaks. And then came the past seven days. Excruciatingly painful. Poor defense and goaltending have plagued the Stars this entire season, but the past week took the struggles up a disappointing notch or two. As of Wednesday morning, Dallas surrendered the fourth-most goals in the league (200) and registered the third-worst goals against average (3.28) in the NHL. The Stars are only 23 goals away from tying the amount of goals the team surrendered in the 2013-2014 regular season, and they still have 21 games left to play. Kari Lehtonen struggled out of the gate this season and has failed to establish any consistency or rhythm. Lindy Ruff recently called Lehtonen out to the media, and it seemed to have jolted Lehtonen into better play. Unfortunately, that only lasted a few games. “@myregularface: GIF: Lehtonen reacts to OT goal pic.twitter.com/RXDKqxHT5e” Tonight’s game in one gif. The barren desert from which no one returns, also known as the Dallas Stars backup goaltender role, chewed up and spit out Anders Lindback early on as it did with many before him. That list includes Dan Ellis, Tim Thomas, Richard Bachman and Cristopher Nilstorp, and that is just over the past three seasons. Lindback’s 2-8-0 record, 3.71 goals against average and .875 save percentage was enough to prompt Jim Nill to make a trade on February 11. In came Buffalo Sabres starter Jhonas Enroth, who just four nights earlier handed the Stars a loss with an impressive 38-save performance. At the time, Enroth owned a respectable 3.27 GAA and .903 save percentage considering he was minding the net for one of the worst teams in the league. Lehtonen was already well on his way to the worst statistical season since coming to Dallas and one of the worst seasons of his career. He remains in danger of setting lows with his current 25-13-13 record, 2.96 GAA and .906 save percentage. 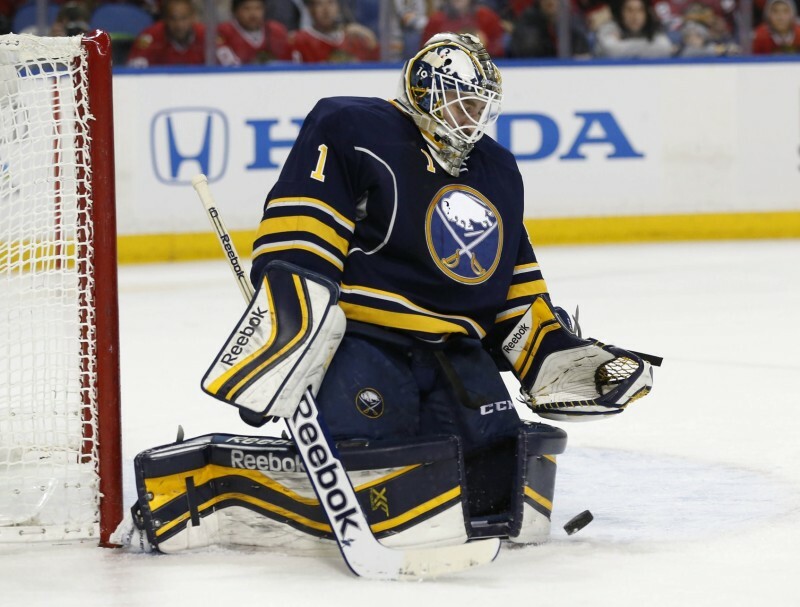 Enroth provides a nimble, reflexive option already used to seeing plenty of shots on a nightly basis. His arrival was expected to push Lehtonen to play better or possibly even allow the newcomer to take over the starting role if Lehtonen could not turn things around. Over the past four games, the team surrendered 22 goals on 124 shots, all losses. Lehtonen and Enroth split the starts, but Enroth came on in relief of Lehtonen nearly midway through one of the games. In that span, Lehtonen stopped 43 of 53 shots for a haunting .811 save percentage, and Enroth stopped 59 of 68 shots for a save percentage of .867. One of the most stomach-churning aspects of the past four losses have been the late game collapses. Lehtonen allowed four third period goals and one in overtime. Enroth gave up eight third period goals, including six in a 6-2 loss to the Minnesota Wild Sunday night. Instead of Enroth pushing Lehtonen in a healthy competition for the starting role, neither goalie seems able to take the reins or steal a victory for a team that was only a handful of points away from a playoff spot with games in hand a few weeks ago. Now, Dallas is six points out of a playoff spot as six teams battle over the two wild cards spots, and two of the teams above them in the standings have a game in hand. There are many factors that led to Dallas’ four-game slide over the past week. Critical turnovers in the defensive zone, lack of defensive support from the forwards, missed coverages, inconsistent goaltending, injuries, back-to-backs games with travel all affected the team, but having something as simple as stable, reliable goaltending would go a long way in helping the Stars win and climb back into the playoff race. There is still hope that at least one net minder can step up and take over in the last 21 games of the season. Dallas’ playoff chances depend on it.